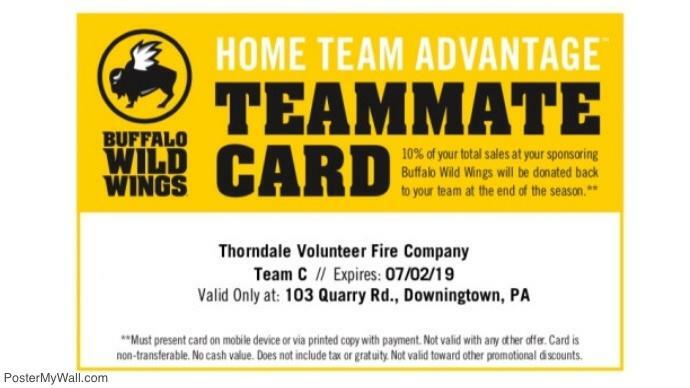 Starting Feb. 2nd and continuing until July 2nd, 2019, Buffalo Wild Wings in Downingtown (103 Quarry Rd.) will be donating 10% of all sales to the Thorndale Fire Company Equipment Fund. To be eligible for the donation, Diners must mention to their server that they are with "Home Team Advantage Team 'C' ". This is a wonderful opportunity for the community to help raise funds for the fire company by simply going out to eat. Copy the team Advantage card photo onto a mobile device so it is readily available. Printed cards will also be available next week in the engine Room & Clubroom.